Unroll pizza dough on lightly floured surface; roll into 12x8-inch rectangle. 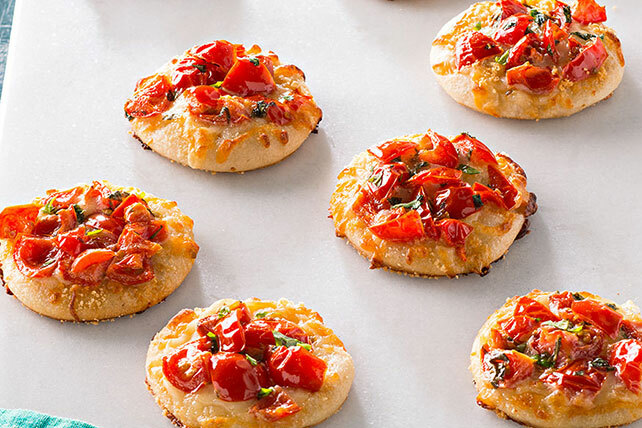 Use 3-inch cookie cutter to cut dough into 20 rounds, rerolling scraps as necessary; place in single layer on baking sheets sprayed with cooking spray. Sprinkle with cheeses; top with tomato mixture. Bake 8 to 10 min. or until edges of crusts are golden brown and mozzarella is melted. Substitute 1 tsp. fresh oregano leaves for the basil leaves. Prepare using 3 chopped plum tomatoes.